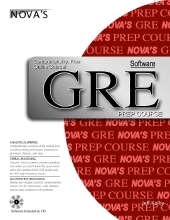 Nova Press offers the most expansive and diverse methods of preparing for the GRE, all designed with you in mind. We offer materials to study via the internet, computer software, book, ebook, or phone app. Choose from the various options below to find the GRE prep that suits your lifestyle and budget (all have been updated for the new GRE). This interactive, comprehensive self-study course combines individually paced learning with the one-on-one attention of our highly trained GRE experts, who are available to answer most of your questions in real-time. The online course material presents the equivalent of over 600 pages of printed material, including hundreds of GRE example problems with detailed explanations. Plus, the powerful learning engine StudyDesk increases your learning efficiency by monitoring your progress and directing you to areas where you need further study. All for only $49.95! Similar online programs through the Princeton Review or Kaplan cost upwards of $699! With more than $650 in savings and quality that can’t be matched, Nova Press is undoubtedly the smartest option in GRE prep. 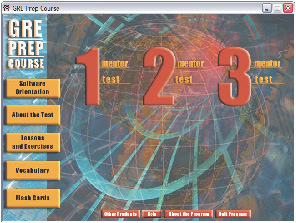 Click here to view the course. For a self-starter on a tighter budget, we offer our GRE Desktop Software. With extensive review of all GRE content matter, hundreds of practice problems, and three scored GRE practice tests, the GRE software program offers a great alternative to the online course, and it’s only $29.95 — that’s less than you would pay for only a book through other prep companies! Purchase now or read more. Every year students pay upwards of $1,000 to test prep companies to prepare for the GRE. Now, you can get the same preparation in a book. GRE Prep Course’s 624 pages of prep material provide the equivalent of a 2-month, 50-hour course for a small fraction of the price. Purchase GRE Prep Course for only $23.97. 40% off retail price! or the eBook for only $19.95. For students aiming to ace the math section of the GRE, this is the book for you. As a companion to the GRE Prep Course book, GRE Math Prep Course includes an additional 524 pages of in-depth review of the most difficult math concepts that can appear on the GRE as well as challenging questions with detailed explanations. If you are aiming to get in the 700-800 range on your math section, you can’t afford not to get this book. Purchase GRE Math Prep Course book for only $20.97. 40% off retail price! The Graduate Record Examinations (GRE) is a standardized test that is an admissions requirement for most graduate schools in the United States. This premium, comprehensive application is all you need to help you prepare, evaluate, and track your proficiency for taking the GRE wherever you go. Whether you have 5 min or 5 hours, you’ll be able to use this app to improve your score and increase your chances of getting into the graduate school of your choice. Comprehensive Twenty-two chapters and hundreds of exercises. Feedback: Real-time feedback and performance analysis – instantly know your competency! Flashcards: Create your own flashcards – test yourself and your friends!